Office pranks can be a lot of fun. As Michael said, in an episode of The Office, “The thing about a practical joke is that you have to know when to start as well as when to stop.” That episode, when Dwight finds that Jim has encased his stapler in jello is one that really gets you wondering what pranks your employees will think of for April Fools’ Day. In order to maintain a productive environment, but still encourage fun, you should set some office guidelines ahead of time so that your employees know what to expect. In Lance Haun’s article on HRPeople, Guidelines for April Fools’ Day at the Office, Lance points out several key things that you should bring to the attention of your employees. Most of these items seem like common sense, but quite often people do not stop to think about these things before setting a prank into motion. Lance brings attention to the simple fact of if you wouldn’t want someone to do it to you, then do not do it to someone else. This is just a common curtesy, which should be thought of at all times in the office. This rule falls in line with the first one. If you can’t be a good sport and handle being pranked, then you should not be pranking others. I have worked with someone before who loved the thrill of pranking co-workers, whether it was April Fools’ or not. However, when someone finally turned the tables and cleverly loosened a screw in the prankster’s desk chair, Mr. Prankster did not find it humorous when he had to pick himself up off the floor. There is nothing more cruel than telling co-workers that a loved one has died, or there has been a fatal accident and then shouting in their face, “April Fools!” Never EVER joke about serious matters. This relates back to the golden rule. You wouldn’t want someone to joke about these things to you. April Fools’ Day can be a fun day in the office. Make sure that your employees understand that fun and laughter is welcome, but that everyone is still there to do a job. As long as work is completed accurately and production does not suffer, there is no reason why fun cannot be had on April Fools’ Day. 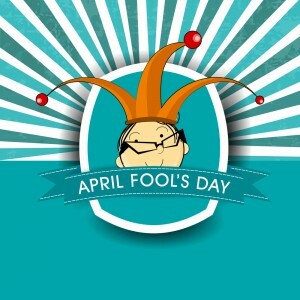 What office guidelines do you have in place for April Fool’s Day? Please share your tips and suggestions in the comments below!